The location was on the beltway surrounding the city of Washington DC on the Maryland side as the highway encompasses both Maryland and Virginia going over the Potomac River in two places. The "Take It!" came from it being near the end of the work day for myself and Taylor who goes along with me on several days of the week. I was behind the wheel as we trade off during the day to keep it more interesting as well as on some long stretches actually give the passenger time for a short power nap. 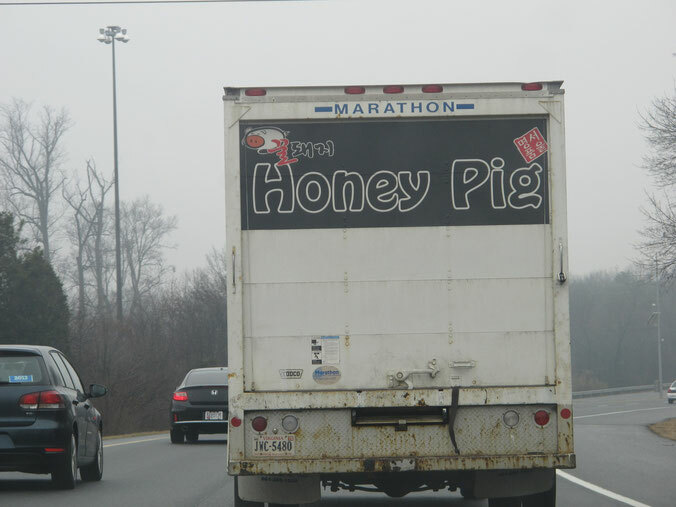 On this day which was dreary with rain at almost all of the time we were out there - the passing by of this labeled truck just was not to be believed by me. I grabbed my camera and took a one handed couple of shots of the truck through the windows of my Toyota. The rear view shot turned out to be the best. I just could not believe that there could be anything that would go under the name "Honey Pig" - lol.. Well - as I was engaged in verbalizing my wonder at this humorous name - Taylor could not understand my wonder. He quickly explained that it was an Asian Food Restaurant. I asked if he had ever been to it - to which he replied that he had. I asked if the food was good and his response was something to the effect that he would be reluctant to go back. He said that the menu seemed to be just a little to basic for him as it included things like "pig intestines" which he totally was not prepared to read about in a restaurant - let alone sample. So, it all comes down to a perception and this is very important. To those who were accustomed to seeing and eating things that are not the usual - this may be a treat. To others - well - lets just say - there are Asian Restaurants that do not have such things on the menu - that many feel more comfortable in patronizing. The After Take: few of the folks that I showed this to had ever heard of the restaurant. Most thought like I did that it was a most unusual name for anything - lol. Here is hoping you too can get a laugh out of this billboard on wheels that needs a bit more writing on it to explain what it is all about. Wishing you a happy day which may include a delicious meal at an Asian Restaurant - consumed using chop sticks or a knife and fork - for it does not matter for it is always a treat. PS: I found that it was incredible luck to have as my copilot, someone who knew the answer to my quandary, and to go even further - had experienced the answer as well. PSS: There seems to be lots of imagination being used in the naming of some Asian Food restaurants in this area. There are lots of "Golden" prefaced names - along with Hunan, China, Pho, and Thai. One of my very favorites is "Thai Tannic" - and better yet - the food is quite good. I am a big fan of Asian and Asian influenced food. Pig intestine sounds just horrible. Not to mention, I'd question the safety of eating them. I saw a picture of a Thai Tanic restaurant, wonder if its the same one. Funny name though. It is an odd name for sure. OMG I would never eat there if thats an item on the menu!!!! Pretty clear image for taking while driving on the freeway. I can't make out the decal on the top left of the truck. Any ideas? One of the great things about our country is the ability to expand ones horizons. While the menu may not look all that appetizing I would be willing to try anything they had to offer.